બાજ કે મોટો શકરો (અંગ્રેજી: Northern Goshawk, goose-hawk), (Accipiter gentilis) એ મધ્યમ-મોટા કદનું શિકારી પક્ષી છે જે ઉત્તર ગોળાર્ધમાં વિશાળપણે ફેલાયેલું છે. વિકિમીડિયા કૉમન્સ પર બાજ વિષયક વધુ દ્રશ્ય-શ્રાવ્ય માધ્યમો (Media) ઉપલબ્ધ છે. 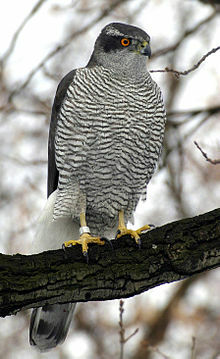 "Accipiter gentilis". Integrated Taxonomic Information System. Retrieved 22 February 2009. ↑ BirdLife International (2013). "Accipiter gentilis". IUCN Red List of Threatened Species. Version 2013.2. International Union for Conservation of Nature. Retrieved 26 November 2013. ↑ "Avibase: Eastern Goshawk". avis.indianbiodiversity.org. આ પાનાંમાં છેલ્લો ફેરફાર ૨૬ એપ્રિલ ૨૦૧૪ના રોજ ૦૧:૩૮ વાગ્યે થયો.